The entire science of hatha yoga is the science of purification and is a prerequisite for all raja yoga practices (meditation, asana, pranayama). There are a total of six practices within hatha yoga, we will be practicing only three this morning; neti, douti and basti. These practices provide only a glimpse into the depth of the purification practices within hatha yoga. For each practice there is a physical benefit for the body as well as a spiritual purpose. The spiritual purpose of neti is to balance the flow between the lunar (left) and the solar (right) channels within the body, opening these channels equally so that the third channel, the shushumna can flow for pranayama and ultimately awaken the kundalini. Physically, the salt water goes inside and cleanses the nasal passages and sinuses providing a physical benefit (especially if you have a cold) to the body. 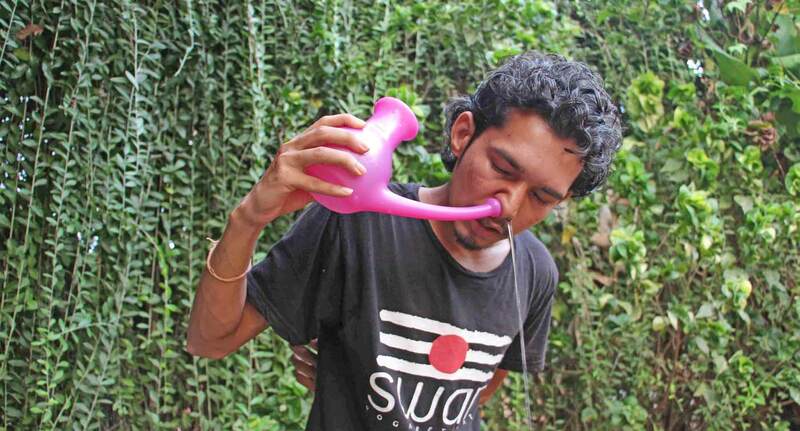 This physical benefit is not the ultimate purpose of neti practice, it is merely a side effect of the practice. Dhauti means‘to wash’and in this practice the spiritual purpose is to wash away the collected emotional garbage within that has become an obstacle to our lives and to meditation. Over time all of the desires, unbalanced emotions and emotional garbage that we gather is held within the body creating a blockage. These stored, unbalanced emotions are the main problem in life so the aim is to wash them away in preparation for meditation. This is accomplished by drinking warm salt water and triggering the gag reflex at the back of your throat to then bring the water out. The spiritual purpose of basti or cleansing of the large intestine, is to eliminate the instant karma. When we experience an emotion or desire that we are not comfortable with, suddenly we feel like eating or drinking something to escape this feeling. These stored emotions, associated with eating are held within the large intestine and they become an obstacle in the path of life that is always pulling us down. To eliminate these obstacles a cleansing of the large intestine is required. In ayruveda the first thing they do, no matter what problem you have, is to recommend basti or an enema to first eliminate this problem in your life.